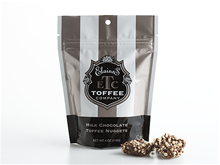 Milk Chocolate Toffee Nuggets 4 oz. For over forty-five years our parents made the most buttery, perfectly crunchy, English Toffee to give to their friends and family at the holidays. Over the years they taught us, their three daughters, how to make it and we are now bringing this traditional English Toffee to you. Our almond toffees are crafted with the finest, all natural ingredients including pure cane sugar, creamery butter, Guittard chocolates and fresh California almonds. Try our milk and dark chocolate Sea Salt Toffees for that perfect blend of sweet and salty. We also offer Toffee Bars in 6 luscious flavors and bite-size Toffee Nuggets for when you need a quick fix for that toffee craving. 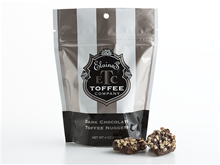 All of our toffees are certified Kosher and are gluten-free. They are available here or through fine retail locations across the US.